There is no doubt that MP4 files are the most popular format which has been widely used everywhere. But sometime you may want to a FLV converter to convert MP4 to FLV format to meet some special needs. To begin this task, let's take a look at these two formats. Developed by Moving Pictures Expert Group (MPEG), MP4 is a digital multimedia container format that is used for storing video, audio, and other data like still images and subtitles. With .mp4 as the file extension, it is one of the most popular and commonly used video formats that allows streaming over the net and is compatible working with an array of platform and devices. FLV, which is a short form of Flash Video, is a container file format that is used for transmitting digital video content like TV Shows, movies, and others over the net using Adobe Flash Player or Adobe Air. These files may also be embedded within SWF files. FLV is a standard video format that is used by the majority of the embedded video over the net including videos on popular sites like YouTube and others. Part 1. Why Do You Need to Convert MP4 to FLV Online? The majority of video sharing sites on the Internet supports FLV videos because of its small size that makes it easy to share. Moreover, FLV files make use of less resource on the computer as well as network and thus you can view and download them smoothly even in situations of the poor network. So it can be concluded that if you have a collection of MP4 videos that you wish to upload or share on the Internet through YouTube, Hulu or other videos sites, then converting MP4 files to FLV format is a good option. 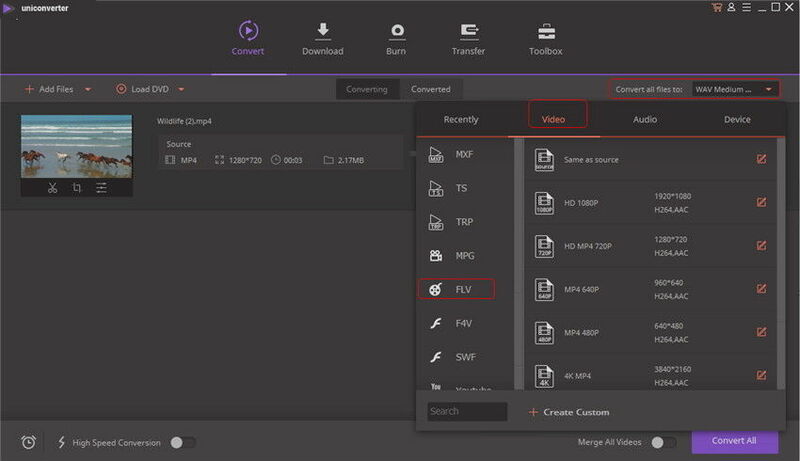 Easy sharing and small file size make FLV as the perfect alternative to MP4. This is one of the top online converters that allow converting MP4 to FLV format. The converter supports an array of video, audio input and output formats. The tool has simple to use interface and allows uploading up to 100MB of a file. You can add 2 files for conversion at each time. The converted files can be downloaded directly or saved to Dropbox. Support batch conversion at one time. Allows uploading up to 100MB file. The conversion speed is limited by the Internet speed. The supported formats are less than Desktop converters. Zamzar is a popular name when it comes to top online converters as the program supports more than 1200 types of conversion including video, audio, eBook, image, CAD, music, and others. Thus in addition to online MP4 to FLV converter, it works as a multipurpose converter. While using the program, you do not need to download any software and thus the entire process is quick and convenient. The link for the converted files is sent to provided email address. Support more than 1200 types of conversion with 1200 file formats. Simple interface with quick conversion process. Support multiple file upload for conversion. Does not allow setting any advanced options for converted file. The maximum upload size is 50MB for free. This is another name in the list of top online converters. The program is simple and free to use. You just need to add the desired file to the program, select output format, and the converted file will be available for download. The online MP4 to FLV converter also allows customizing the conversion process by setting bit rate, clip length, FPS, resolution, and other features of the file. The program also has an option where conversion quality can be selected from options of highest, high, medium, low, and lowest. There is also an option where you can save your converted files to your Dropbox account. Allows selecting bitrate, resolution, frame rate and other parameters of the output file. Converted file can also be saved directly to Dropbox. Does not allow adding multiple files for conversion process. Limited format support as compared to other converters. File conversion is a decent online converter that allows converting video, audio, and archive files of different formats in addition to MP4 to FLV. Using the program, you simply need to add the desired file from your PC, select the output format, select quality, and size and then initiate the conversion process. The converted files are made available through a download link. The converter allows selecting the size of the output file and also its quality. Allows selecting size and quality of the output file. Limited file format support as compared to other online converters. 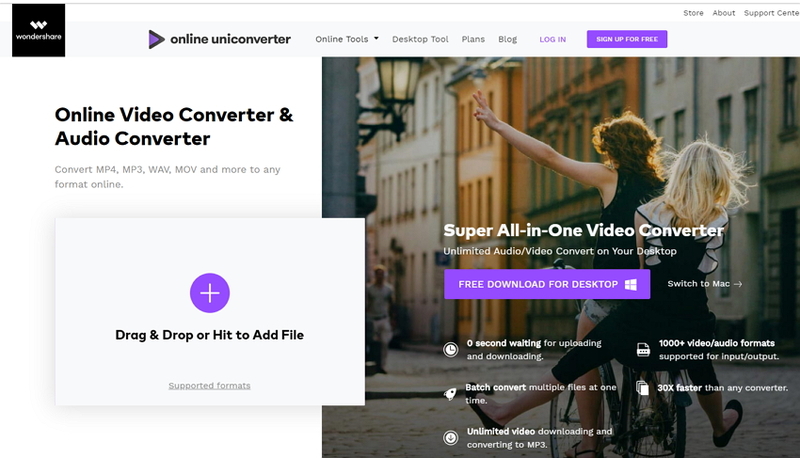 Convertio is a popular online converter that comes loaded with the host of features to make your MP4 to FLV conversion process quick and convenient. The program, supports different video, audio, archive, image, eBook, and document formats for conversion. Available for windows as well as Mac system, Convertio allows adding files from computer, URL, Google Drive, and Dropbox. Once the files are converted, they can be downloaded from the interface or can also be directly saved to Google Drive or Dropbox. The converter allows adding multiple files at a time for the conversion process. 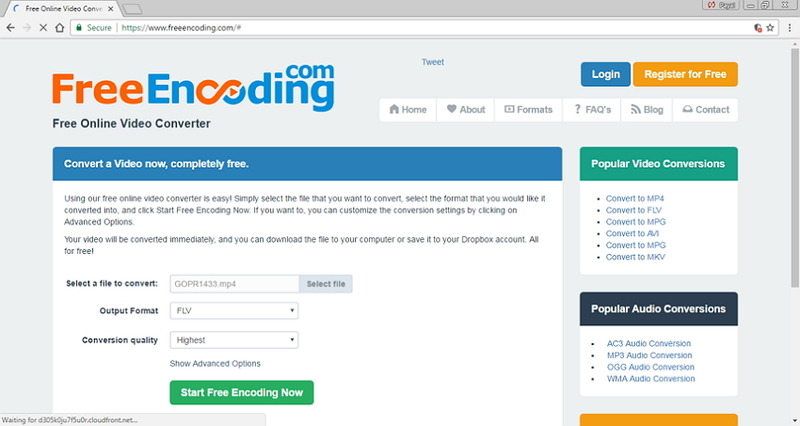 Allows adding files from multiple sources including PC, URL, Google Drive, and Dropbox. Support adding multiple files at a time for conversion process. Besides downloading, converted files can also be saved to Dropbox or Google Drive. Does not support setting advanced file options like quality, resolution, and others. Directly convert MP4 to FLV, AVI, MKV, MOV and other 1000 formats. Allows adding multiple files for batch conversion process at 30X faster speed than common converter. Allows burning, creating, and converting DVDs. Step 1 Launch Wondershare FLV converter and add MP4 file(s). Download, install and launch UniConverter (originally Wondershare Video Converter Ultimate) on your PC. On the main software interface, click Add Files to add the desired MP4 file from your PC. Alternatively, you can also drag and drop the required files. The selected MP4 file will be successfully added to the software interface. Step 2 Select FLV as the output format. On the right side panel of the software beside Convert all files to, select FLV and the resolution from the Video category. Step 3Start the MP4 to FLV conversion. 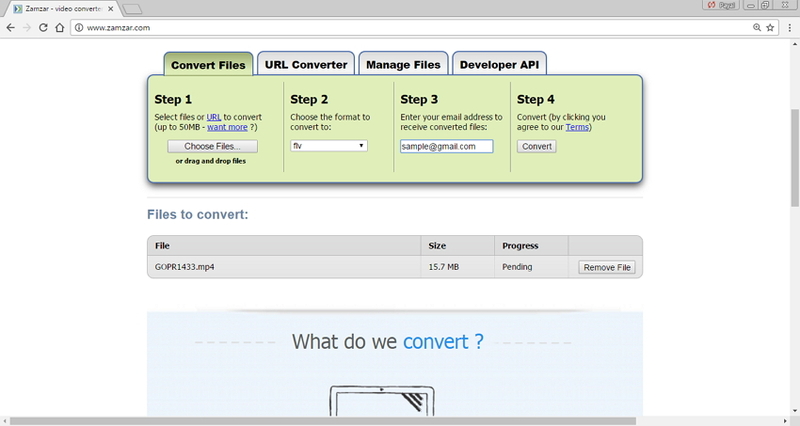 Finally, click Convert or Convert All to start the conversion process. The MP4 file will be converted to FLV and will automatically save to the selected output folder. Considering the above listed online converters and professional software, it can be concluded that all of them have their pros and cons. Online converters are great when you are looking for a free option with a few number of files for conversion process without any need for additional features. When it comes to a large number of files that needs to be converted with additional features, professional software like Wondershare UniConverter (originally Wondershare Video Converter Ultimate) proves to be an apt choice. Where professional software needs download and registration, online converters are dependent on the availability of internet connection. Thus it can be said that selecting between online converters and desktop software totally depends upon your requirements and expectations from a converter. For regular users, download Wondershare UniConverter (originally Wondershare Video Converter Ultimate) to have a free try now.